Members of the UN Security Council speak to the media after arriving in the Democratic Republic of the Congo on 5 October 2018. “The Security Council must put all its weight [behind] our priority objective: elections by 23 December, which are credible, transparent, and held in a calm climate,” François Delattre, the Permanent Representative of France to the UN and leader of the Council mission, said on Friday evening during a press briefing in Kinshasa, the Congolese capital. Arriving in Kinshasa Friday afternoon, the Security Council delegation held a two-hour “working session” discussing the progress and challenges of the electoral process with the office of the Independent National Electoral Commission (CENI). The President of the CENI, Corneille Nangaa, thanked the Council for the considerable support of the UN to the elections process. “Today we have more than 130 international MONUSCO experts who are our advisers,” Nangaa told reporters, referring to acronym for the UN stabilization mission in the country. He also made clear that the DRC Government had decided “not to solicit other financial and logistical support from partners”. Mr. Nangaa went on to stress the need to reconcile a critical double imperative: the credibility of polls and their holding on 23 December. The Security Council also met on Saturday with the National Episcopal Conference of the Congo (CENCO), which facilitated the signing by the Government and the opposition of the so-called ‘New Year’s Eve agreement’ on December 31, 2016, by which elections were to be held before the end of 2017. After a postponement, marked by violent protests, the polls were finally announced for late December 2018. For CENCO, the meeting with the Council delegation was an opportunity to express “the fears, difficulties and worries” related to the electoral process, but also to emphasize that “the process is moving forward”. “CENCO has been inviting political and social actors to seek consensus around the problems that divide them,” Fr André Masinganda, the First Deputy Secretary-General of CENCO, told Radio Okapi, citing, among others, problems related to the electoral register and the voting machine. 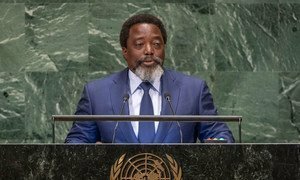 Every effort would be made to ensure the peaceful and credible elections in the Democratic Republic of Congo (DRC) by the end of 2018, President Joseph Kabila announced on Tuesday to the United Nations, where he also vowed to oppose any interference in the electoral process during the run-up to the polls. 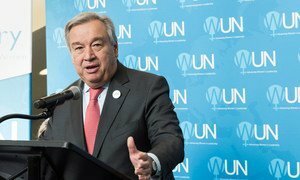 United Nations Secretary-General António Guterres has called on the Government of the Democratic Republic of the Congo (DRC) to exercise restraint amid reports of a violent crackdown by national security forces on demonstrations in the capital, Kinshasa, and a number of other cities.